Through Suzuki Foundation, Suzuki Philippines, handed over a cash donation to Sagip Kapamilya to aid the families affected by Typhoon Lawin that brought heavy destruction in Northern Luzon. Suzuki’s SHARE Program or Suzuki Helps, Aids, and REbuilds is their response to all motorists affected by typhoons or calamities. This includes free check-up, tune-up, and oil filter to all Suzuki motorcycle owners. Suzuki Philippines, Inc. President Hiroshi Suzuki (in the middle) accepts the certificate of appreciation from Sagip Kapamilya's Program Director Higino Dungo, Jr. (leftmost) Together with them is Suzuki Foundation President and Suzuki Philippines, Inc. Managing Director Norminio Mojica (rightmost). 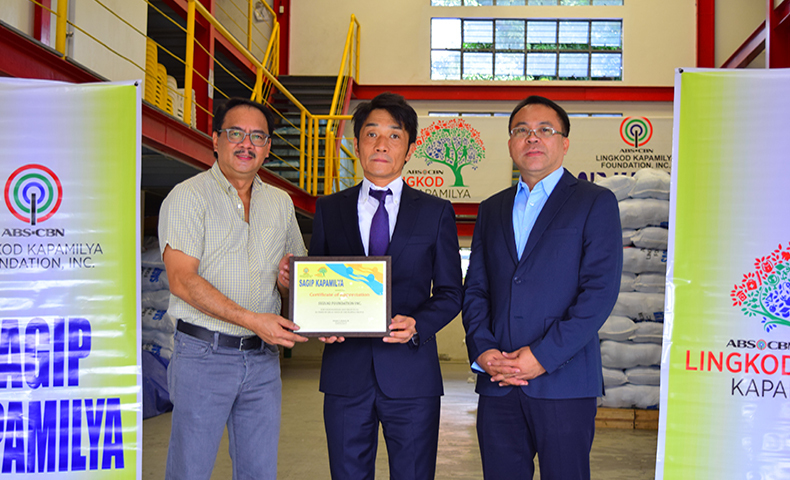 Hiroshi Suzuki, President of Suzuki Philippines, Inc. believes that as a company, they have “the responsibility to help and donate to typhoon-affected families” as their way of giving back to the community. Suzuki Philippines has been a partner of Sagip Kapamilya since the onslaught of Typhoon Yolanda back in 2013. Aside from financial assistance, the company also rendered its services for Sagip’s relief operations by lending their own Suzuki trucks. “Regular donors talaga natin sila at everytime na merong major calamity o kahit nga minsan, hindi major, pupunta at pupunta sila rito para mag donate,” said Higino Dungo, Jr., the Program Director of Sagip Kapamilya. “Gustong-gusto nilang matulungan ang mga Kapamilya natin na naapektuhan ng mga calamities,” he added. To date, Sagip Kapamilya has served more than 9,000 families affected by Typhoon Lawin in Northern Luzon. Read: Sagip Kapamilya’s Relief Operations for Typhoon Lawin. Suzuki Philippines’ donation will be used for the rehabilitation projects of ABS-CBN Lingkod Kapamilya’s emergency assistance program for Lawin affected areas.